The life and nuclear-weapons work of renowned physicist Adam Brooks form the center of an orbit that binds his family to him as he struggles to find his place in science, history, and love. In this debut novel, searingly brilliant characters fill a world at once fascinating and familiar in its humanity, empathy, and humor. But even more than a revelation of the lives of its characters, Lost, Almost is a meditation on brilliance and on the cost it exacts from those who possess it and those who live adjacent to its light. 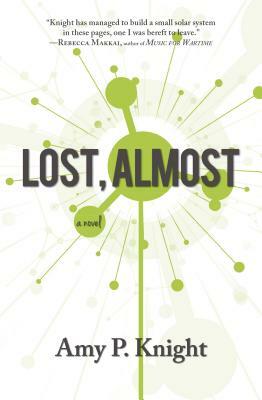 Told from the perspectives of Adam Brooks' loved ones and acquaintances, interspersed with reflections in his own perspective, Lost, Almost gives us a clear and shimmering view of the magnetic pull of genius and the ways it repels the human connection we require to survive and thrive. Winner of the Engine Books Fiction Prize, judged by Rebecca Makkai. Amy Knight is a civil rights and criminal defense attorney. She lives in Tucson, Arizona with her dogs, Oscar and Ruby.